LONDON, UNITED KINGDOM, March 11, 2019 /EINPresswire.com/ -- SMi Group are delighted to have Dr Joël Richard chairing the two-day conference. Dr Richard is presently leading the Technical and Pharmaceutical Development activities for the Medincell Company, Lead Candidate Selection to all Clinical Development Phases. 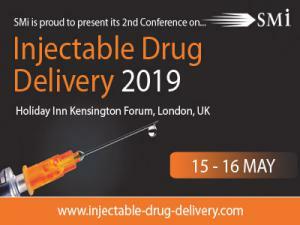 As Chair of the 2nd Annual Injectable Drug2 Delivery3 Conference, this is my pleasure to invite you to attend this event taking place on May 15-16, 2019 in London. This second session of the SMi Annual Injectable Drug Delivery Conference will bring together tremendous expertise in multiple fields of Injectable Drug Delivery. The two-day compact agenda will offer a series of presentations, through which you will gain key insights into current trend and innovations in injectable drug delivery, assessing and discussing the innovation in formulations and devices for injectable delivery. Key challenges in injectable drug delivery are related to the administration of high concentration, high viscosity and high-volume formulations of more and more complex molecules, like biologics, and to the design and development of long-acting injectables1. Rapidly changing regulatory environment should also be taken into account to drive innovative development and ensure compliance with quality systems. Then, devices appear as strong enablers to market success, becoming more and more sophisticated and bringing additional functionalities. Patient centricity is driving the future of injectable drug delivery market, and digital enhancement and device connectivity will help improve patient treatment compliance and healthcare professional’s security. •	Manufacturing, filling and Quality control, addressing the challenges of manufacturing of high viscosity, high volume and long acting injectables, especially for biologics. Prior to the main event, one pre-conference half-day workshop will be held on Tuesday, May 14, 2019. It will provide you with the opportunity to broaden your knowledge and discuss about “Use-related risk analysis throughout a design and development project”, understanding how Human Factors relate to the overall design and development process.